In an earlier post, I explored and analysed the uneven geography of UK train geography. As I write this on 15th November 2017, it is International GIS Day, and in the spirit of analysis and geography, I have decided to compare this to transport geography of train stations in another geographical situation. I have focused on Germany and the Netherlands in these examples, seeing if the uneven nature is a general trend elsewhere or a more British geographical experience. I have kept the parameters of measurement the same to try and provide a fair comparison. As we can see in the above map, the distances to stations in the Netherlands is not as high as in remote areas of the UK, with the largest distances being 15 miles to a train station compared over 25 miles in parts of the UK. This may not seem like much, but factoring reliability of public transport in parts of the UK and the relatively high costs of train journeys generally, this becomes more of an issue. 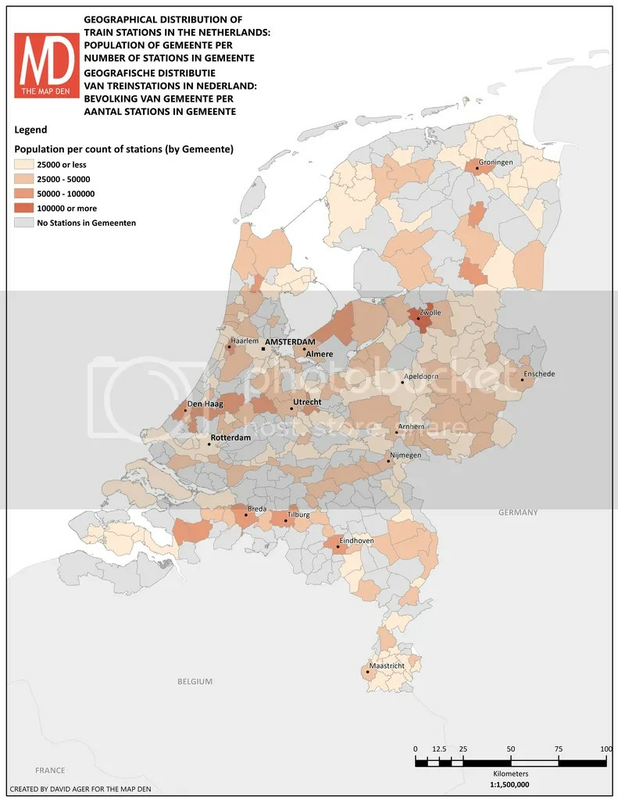 Furthermore, the demand, district (‘gementeen’ in the Netherlands) population per station, is much more balanced generally in the Netherlands compared to the UK, though admittedly there are many districts without a station at all. However, it must be noted the differing geography in the Netherlands; it is a smaller country where the population density is relatively high per square metre, focussed around the ‘Randstad’ (Amsterdam, Utrecht, Den Haag and Rotterdam), something reflected in the maps above. Additionally, while the low-level of the Netherlands presents its own engineering challenges, the terrain in the UK is more variable across the country – train stations in the Highlands of Scotland, Snowdonia, or the Pennines are a different challenge shaping geography here, let alone sparse populations here. So it begs the question what the situation is like in a larger country with greater variations in terrain. Germany is behemoth of a country, one of the largest in Europe, with major populations north, south, east and west, as well as physical geography that varies from low boggy land of North Sea coast, to forested uplands in central Germany and mountainous Bavaria to the South. 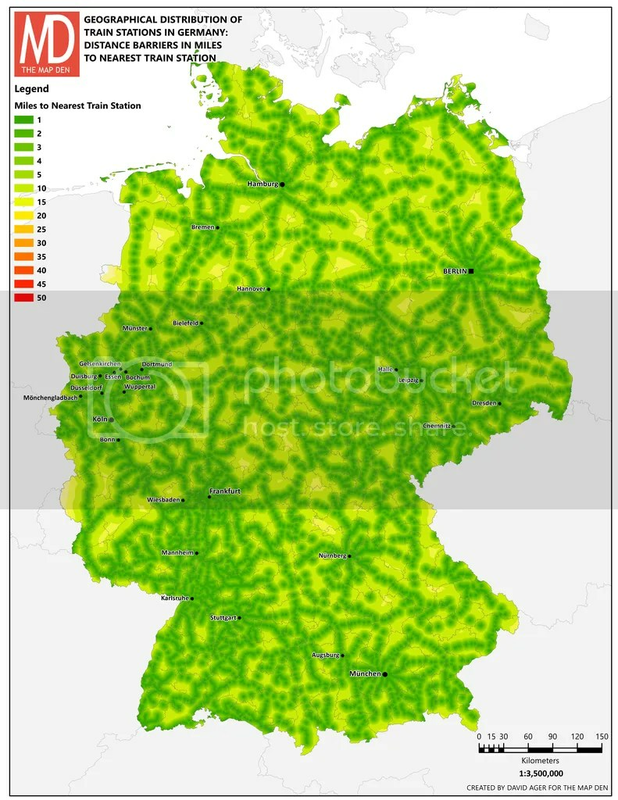 However, while you might expect challenges from this vast and diverse geography, the high density of stations and low distance to them across Germany suggests otherwise. Whether there is any truth or not to the term ‘German efficiency’, it is remarkable that no area is more than 15 miles away from a station, and a large proportion is less than 10 miles. This is further reflected in the ‘station demand’ map above as well, where there is a generally even demand compared to the UK districts. The picture in reality may be different on the ground from a commuter’s perspective, but just some simple geographical analyses can be shown to be powerfully effective in showing something deeper. It can be shown how infrastructure and human geography can be one way analysing both cultural approaches, and political and physical geography. The journey doesn’t stop here – I could have compared other countries, the vastness of Russia and the Trans-Siberian railway, or the US railroad system which reflects East and West coast biases. OpenRailway Map is an web map which uses OpenStreetMap data to display the variations and infrastructure of the world’s railway system, and is well worth checking out if you are interested in this.